A coalition of agitators in the Niger Delta said yesterday that it has set off programmed attack troop to bring to a halt further oil exploration and exportation from the region, following the current NNPC outrage and scandalous revelation by the World Bank that President Muhammadu Buhari directed the financial institution to concentrate development in northern Nigeria. 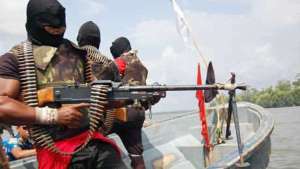 The groups – Niger Delta Revolutionary Crusaders, NDRC and 21st Century Youths of Niger Delta, in a statement by WOI Izon Ebi, also expressed displeasure with the Federal Government over its purported delay strategies and calculated frustration with Operation Crocodile Smile II to put a damper on the implementation of the agreement reached with the Pan Niger Delta Forum, PANDEF. The statement read, “The current revelation of the World Bank and the present NNPC scandal has given us no choice but to activate our digital strike team to swing into action to stop further exploration and exportation of oil from the Niger Delta.” “For it is very obvious that this present administration is for the North only, without putting into cognizance that 90 per cent of the resources that sustain this nation is from the Niger Delta.” “We want to warn that this deliberate provocation and intimidation by the northern oppressors to provoke the Niger Delta people would be counterproductive because we are going to resist them with the last drop of our blood and a devastating response,” it said. The coalition emphasized its determination “to start attack on all oil infrastructures,” saying, “We would not allow our resources to be used to fund only the north and intimidate us, rather than developing the Niger Delta deprived of its God-given resources since 1958.” “The antics of their divide and rule tactics would never work again in the Niger Delta in this 21st century because the world and all honest Nigerians have seen the antics and tactics of the federal governments’ insensitivity and insincerity after the adoption of the 16-point agenda of PANDEF on the 3rd of August 2017. “It is still very fresh in our minds the betrayal of Isaac Boro to keep Nigerian one, the killing of Ken Saro Wiwa and the Ogoni 9 and the dehumanization of their bodies with acid, the genocide in Odi, the genocide in Gbaramatu Kingdom,” the coalition asserted. Its words: “We the NDRC and the 21st Century Youths and all affiliate organizations are determined to prove to the world that we are not cowards. only noise making you people been up, or they come and give you peanut and you keep quiet. is it not obvious what FG is doing? divide and rule, use your resource to buy arms and deploy it to you people to kill any one who want to stop them from taking the oil that only belong to the northerners.